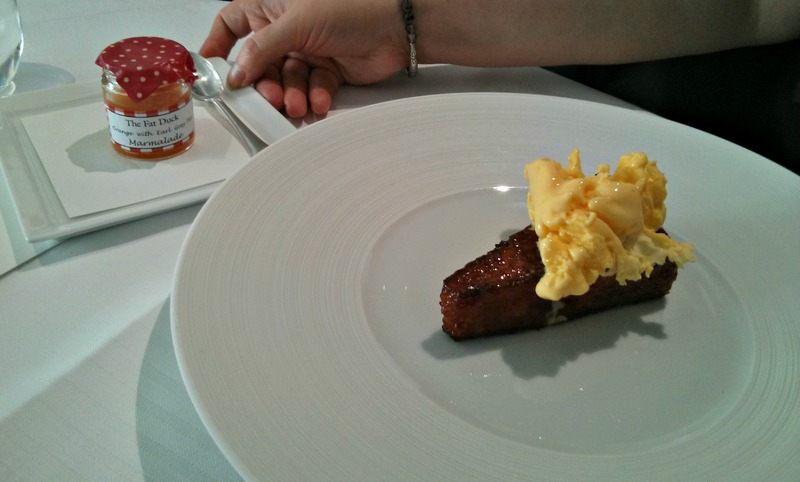 We finally had a chance to eat The Fat Duck at the end of June, the world famous restaurant of Heston Blumenthal. 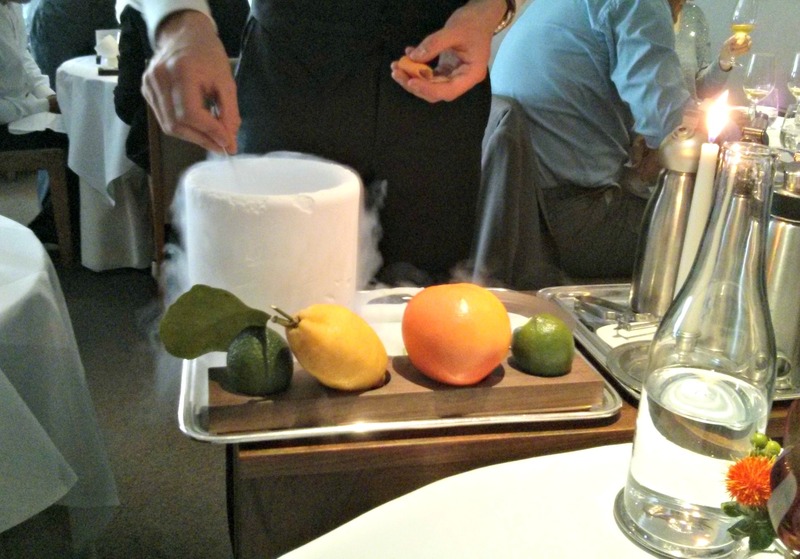 Of all the restaurants I've eaten at, the hardest to get a booking so far has been The Fat Duck, which involved lots of refreshing websites at 10am over a period of months until I finally got a slot on the Saturday lunch I really wanted. The thing with The Fat Duck is that if you've watched a bit of TV or read a few websites and reviews you'll have a pretty good idea of what to expect, or if like me, you've read all the blogs, watched all the clips on youtube, caught all of Heston's TV programmes, even so far as knowing how they make most of the dishes. 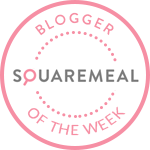 One thing is a little harder to track down, and that's how they cater for vegetarians, but I'd seen a few blogs, noting that in most cases, they provide vegetarian versions of their standard dishes. We arrive a little late, and park in the car park in front, passing the development kitchens and prep kitchens before crossing the road to the restaurant itself. You enter the front door directly into a dining room, a cozy low ceiling room, surprisingly small. We are shown the menu for the day, and they double checked on my wife's dietary requirements, confirming no fish, meat or derivatives (gelatine and the like). We start with a glass of rose champagne, and in short order a canape arrives, a sphere of aerated beetroot with a horseradish cream centre, within seconds it disintegrates in the mouth leaving the flavour of earthy beetroot and bite of horseradish. A table was set up next to us, and on this laid out the accouterments of the opening act, a lit candle, some fruit, 3 NO2 chargers, and a insulated bowl steaming with liquid nitrogen. We were given a choice, vodka and tonic, tequila and lime or gin and tonic. My wife went for the vodka, and I decided on the tequila. The NO2 chargers dispensed a flavoured egg white, and this was dropped into the nitrogen and stirred for a few seconds until forming a meringue. This was quickly popped into the mouth and with puffs of smoke rapidly dissolved into a beautiful icy sweet shot of cocktail. Following this was the Red Cabbage Gazpacho, a grain mustard ice cream was laid on some cucumber cubes, into this poured a vibrant purple red cabbage soup. The mustard ice cream was made with Pommery mustard and wonderfully smooth with a lovely flavour, matching the acidic red cabbage gazpacho perfectly. The first course saw two variations of a tribute to Alain Chapel, Jelly of Quail, Crayfish Cream and Jelly of Smoked Mushroom, Truffle Cream and Pea. First a large slab of moss in a box was laid on the table, and then we were handed a thin strip of film resembling those breath freshener strips. These were laid on the tongue to provide a aroma and taste of the forests; earth, truffle and oak. 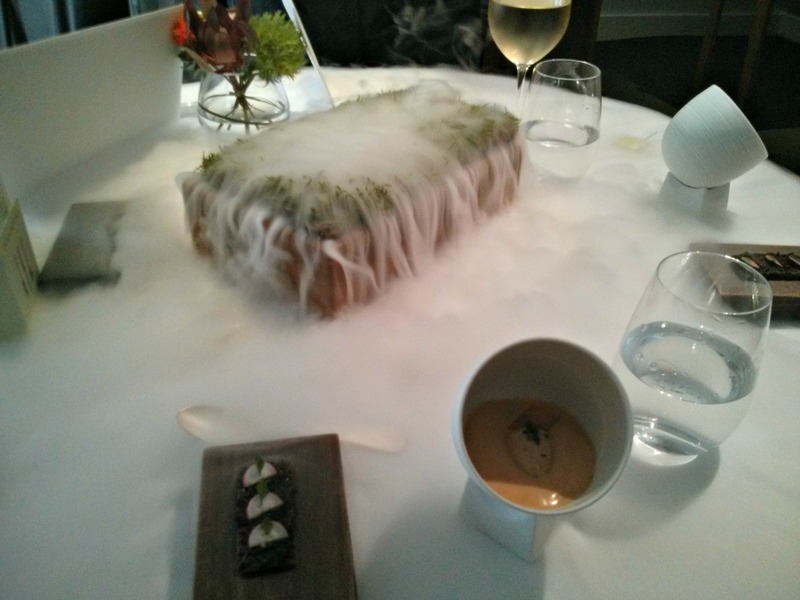 Hot water was poured onto the moss activating the dry ice, which covered the table in further scents. The dish itself was a bowl containing a base of pea, quail jelly, topped with a crayfish cream and a quenelle of chicken parfait. The tastes i think summed up The Fat Duck and Heston's recipes very well by representing a concentration of flavour and aromas, the quail jelly tasted like a brace of roasted quails distilled into a few spoonfuls, and each other element the best examples you will have of their kind. The vegetarian version of this dish sees an intense smoked mushroom jelly, a smooth truffle cream and some peas, the top ones briefly frozen and retaining a dusting of ice. 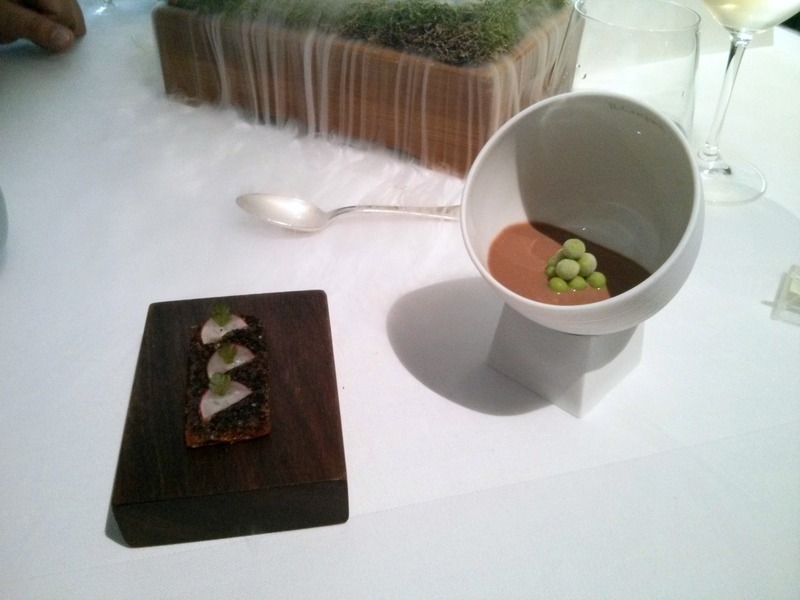 The dish came with a truffle toast finger, itself a fine accompaniment to each spoonful. Following this was a classic of Hestons, the Snail Porridge. 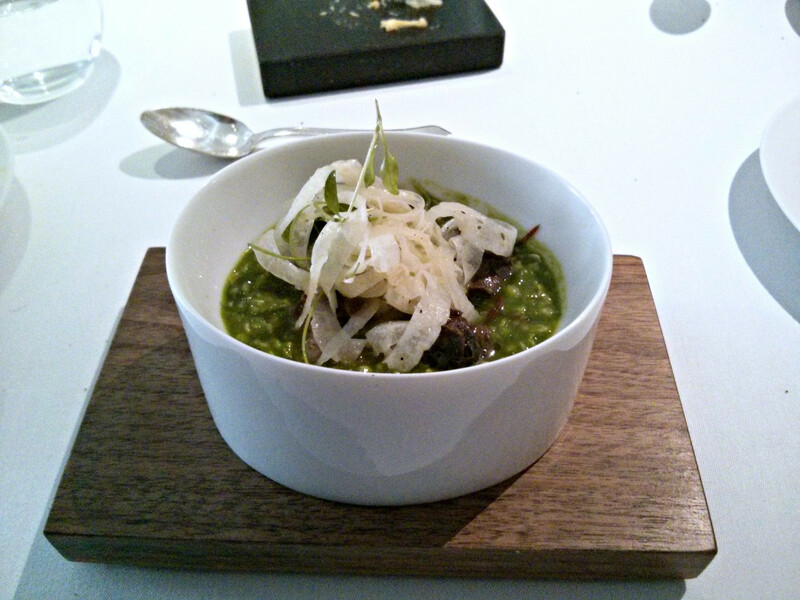 This is vibrant parsley porridge, with shavings of fennel and iberico ham and some plump snails. Excellent flavours again, with the snails being lovely and meaty. The vegetarian version had a replacement for the ham, possibly seitan, and extra fennel. 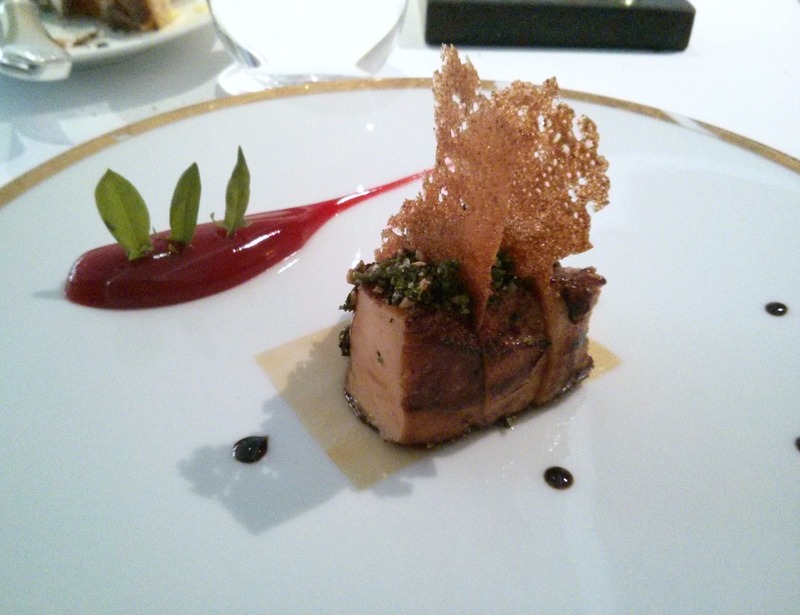 The next course was the Roast Foie Gras. This came with a beautiful barberry puree, tart and sweet to balance the foie, with some translucent wafers of crab biscuit and braised konbu. The vegetarian version saw a really fine piece of roasted aubergine, with aubergine puree and konbu and some really fabulous savoury and umami flavours. Next up was perhaps my most anticipated dish, Mad Hatters Tea Party, and we were presented a card with some Alice In Wonderland text and images to prepare us. 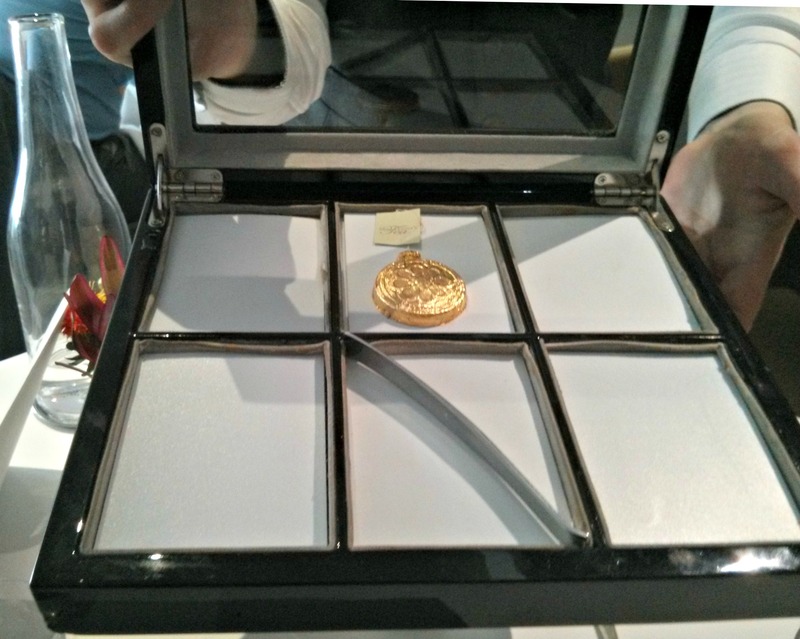 Firstly a glass bowl with the dry ingredients covered in a small glass teapot was placed on the table, then the waiters presented a fob watch of gold leaf. This was placed in the teapot with the hot water. After swirling round the bowl for a bit to dissolve the watch, filling the teapot with a dark broth. You then poured this in the bowl. The bowl contained a mousse of turnip, enoki mushrooms, cubes of calves cheek and turnip and some herbs. 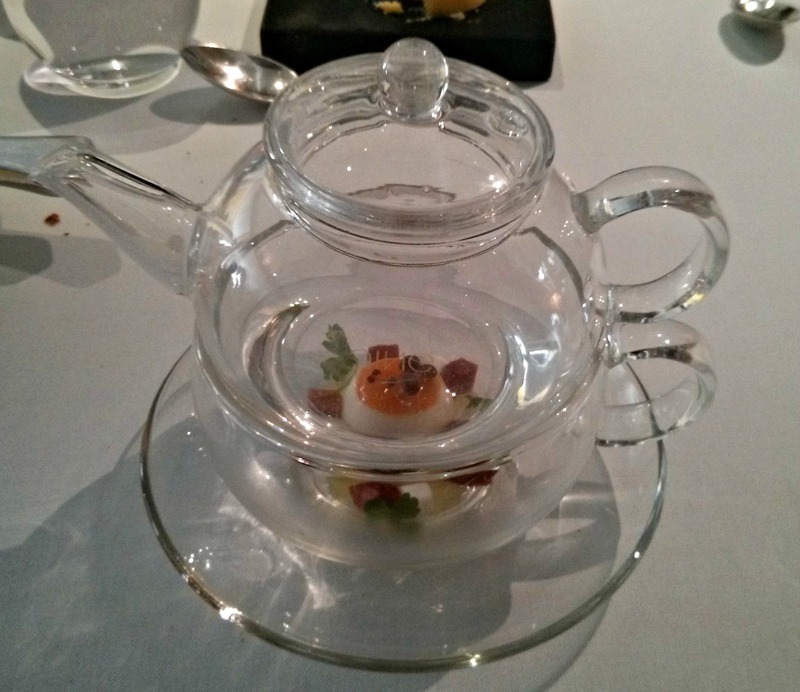 A good example of the attention to detail placed on every dish was the level of the broth, the teapot and stock concentrate filling the bowl and coming exactly level with the orange "yolk" island with enoki mushrooms on top. 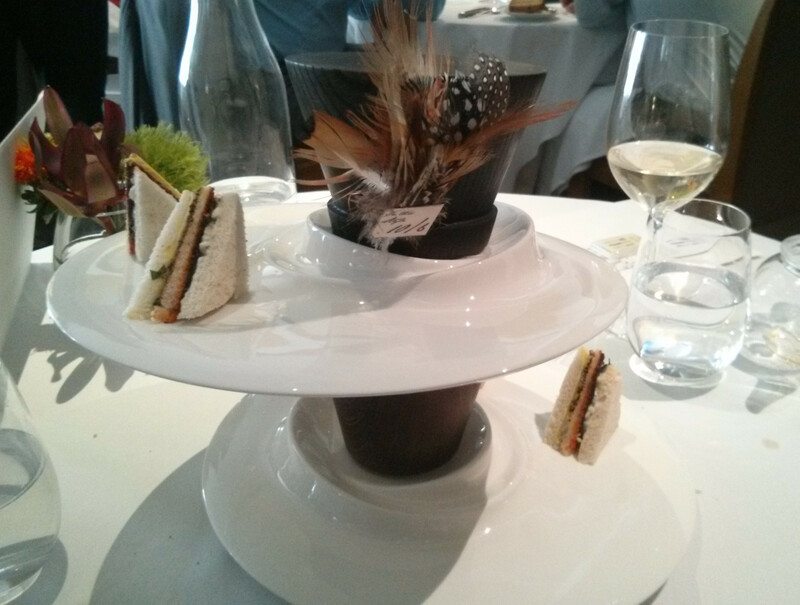 Also with the dish an elaborate hat shaped plate with some toast sandwiches. For my wife the stock was already prepared, but resembled mine exactly, including the gold leaf and care was taken to ensure that the vegetarian versions of the truffle toast were on a different layer of the serving plate. T The broth really was superb, containing the kind of flavour intensity only 5 days of prep, a freeze drier and a -80 fridge can provide, but with a clarity that meant you didn't lose the turnip, mousse and calves cheeks at all. The toast sandwiches were awesome, with the soft bread, crisp toast and beef, mustard and truffle being at the same time both unlike anything you'd had before and the same time as being as well known and familiar. 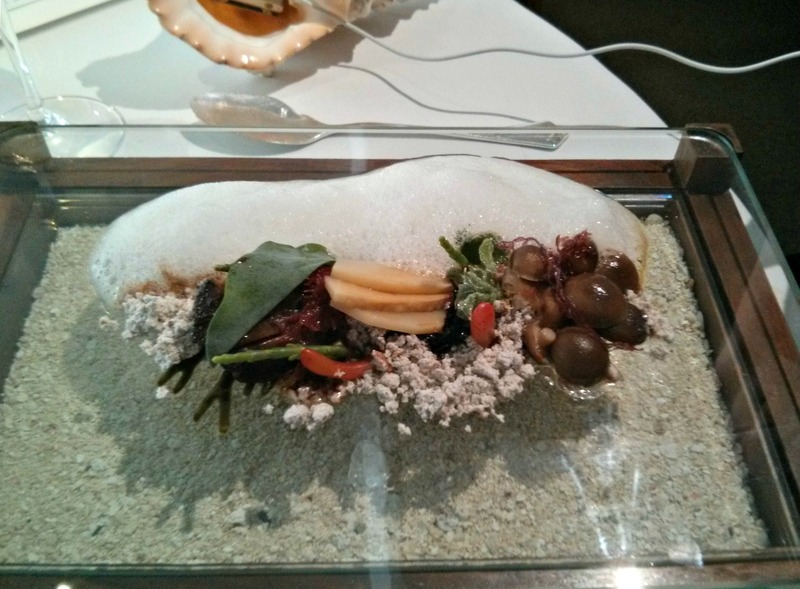 Sound of the Sea is another well known dish, and most food lovers will recognise seashore design and shell with earphones. 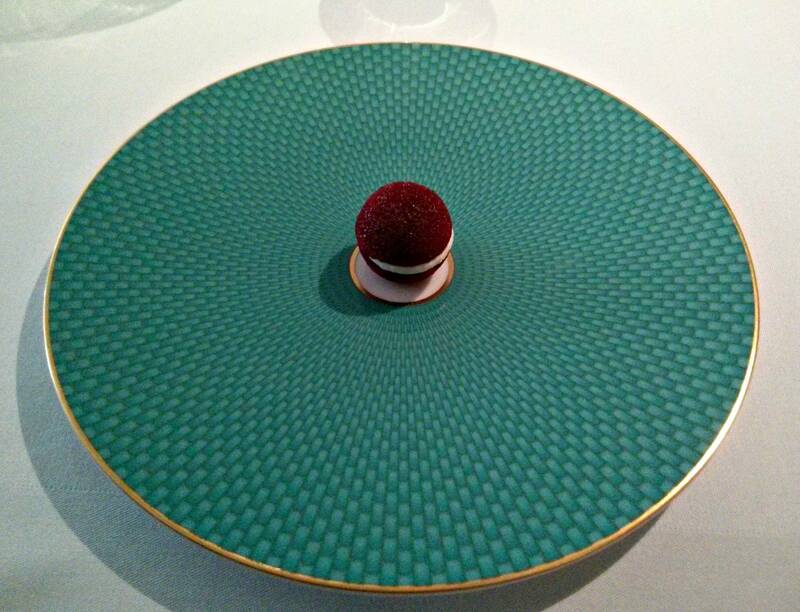 The dish itself has evolved, and differs from the one in the Fat Duck cookbook and other previous incarnations. The current features abalone, mackerel and kingfish. The mackerel was lovely, with a distinct citrus brushing of yuzu, the kingfish tender and sweet, the abalone exceptional, soft and with good flavour, not a hint of rubberiness. 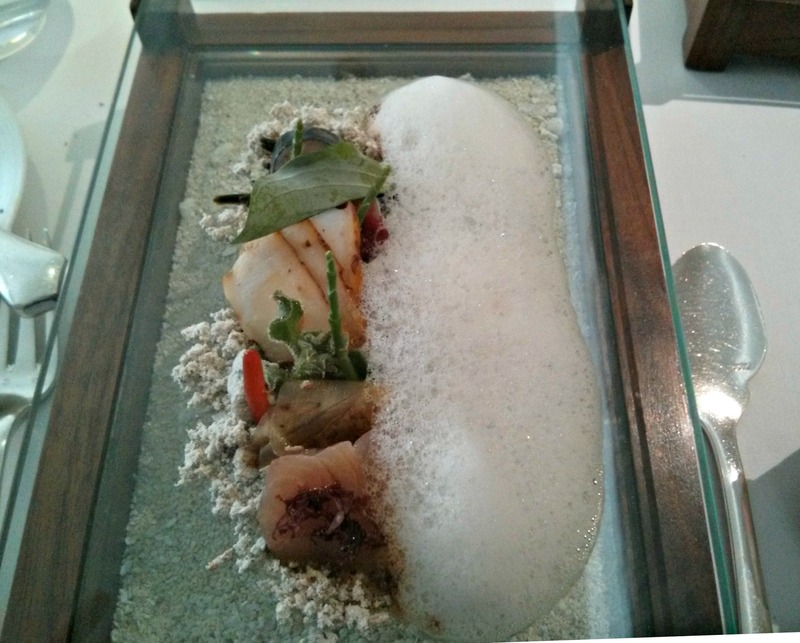 I loved the seaweeds and vegetables, especially the sea bean, a tiny burst of flavour reminiscent of sea and rock pools. The vegetarian version featured mushrooms replacing the fish and abalone, but not missing the flavours of the sea due to the seaweed and sea vegetables. 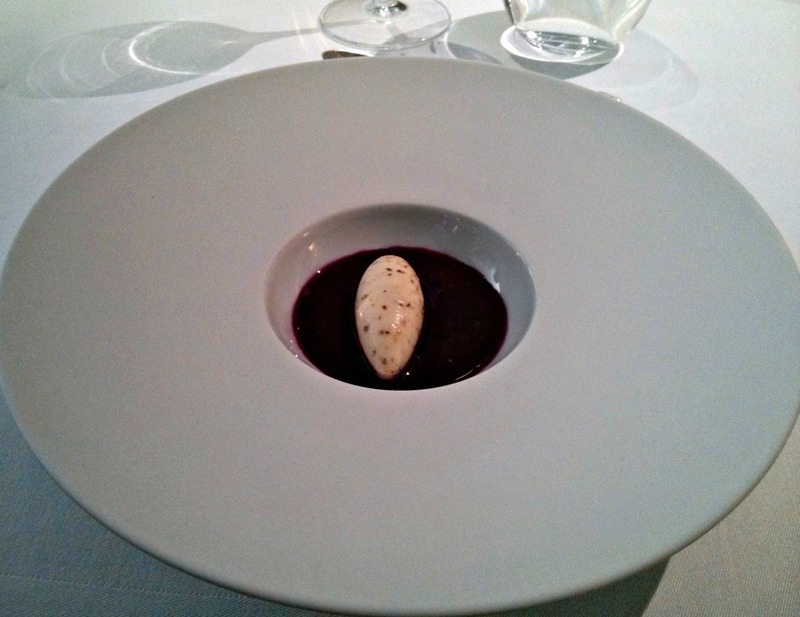 The following course saw two different dishes, unlike previous courses where vegetarian versions were provided. My wife's dish was a beetroot risotto, but unlike any risotto I've seen before. 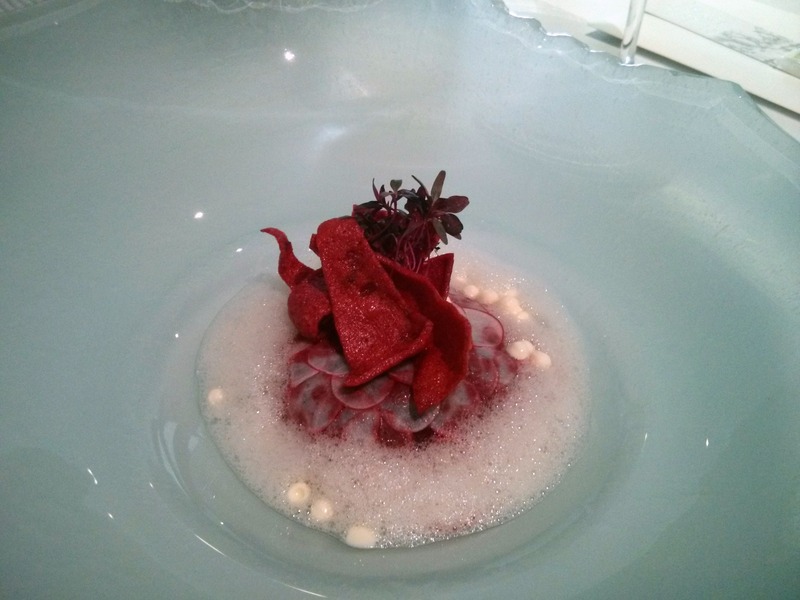 The risotto itself was covered in a dome of identical radish slices to form a half sphere, and covering this a foam, beetroot crisps and droplets of sour cream sorbet. All parts were fantastic, a superlative risotto, wonderful sorbet and perfect beetroot crisps, an absolutely stunning dish. 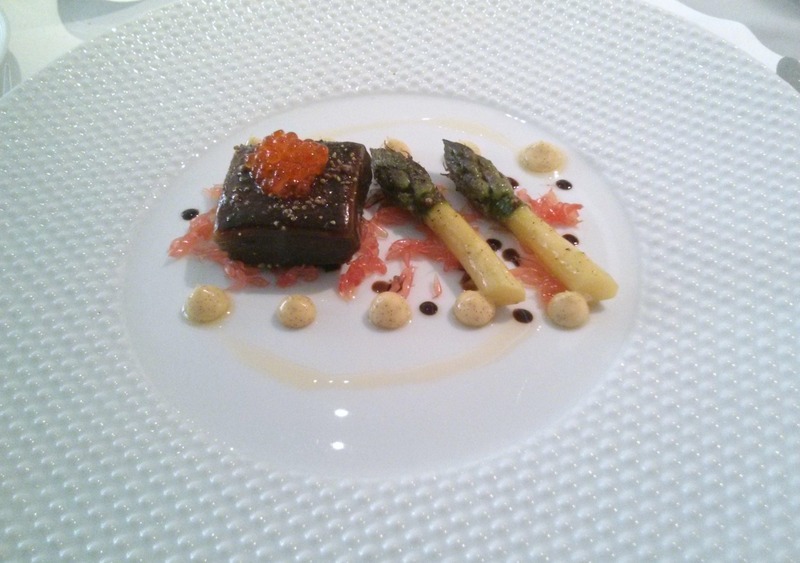 My salmon was poached in a liquorice gel, and came with asparagus and vanilla mayonnaise. The salmon was superb, cooked sous vide and soft and flaky and yet translucent and looking almost raw. The liqourice gel was more subtle than expected, definite hints of liquorice but not the primary flavour, a combination of salmon and vanilla from the top notch mayonnaise. The final main course included possibly the most unique vegetarian dish I've seen to date, Vegetarian Bone Marrow, Marmite Broth and Sauce Gribiche. The bone marrow was a play on words, marrow formed into a bone shape and this was filled with a horseradish set puree. This was placed in a bowl of rich broth, with a selection of vegetables and morels. 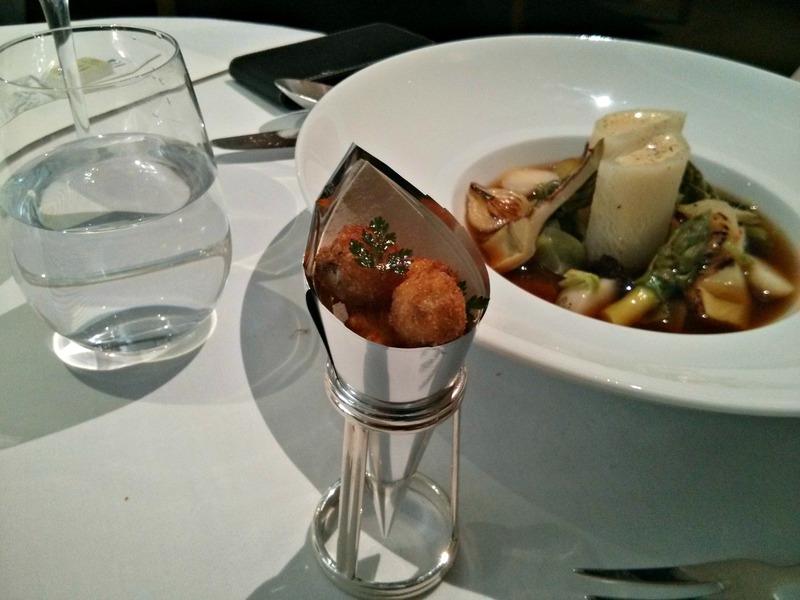 Accompanying the dish was a cone of exquisite little cheese balls. Again a world class vegetarian dish on display here, an original idea with perfect execution. 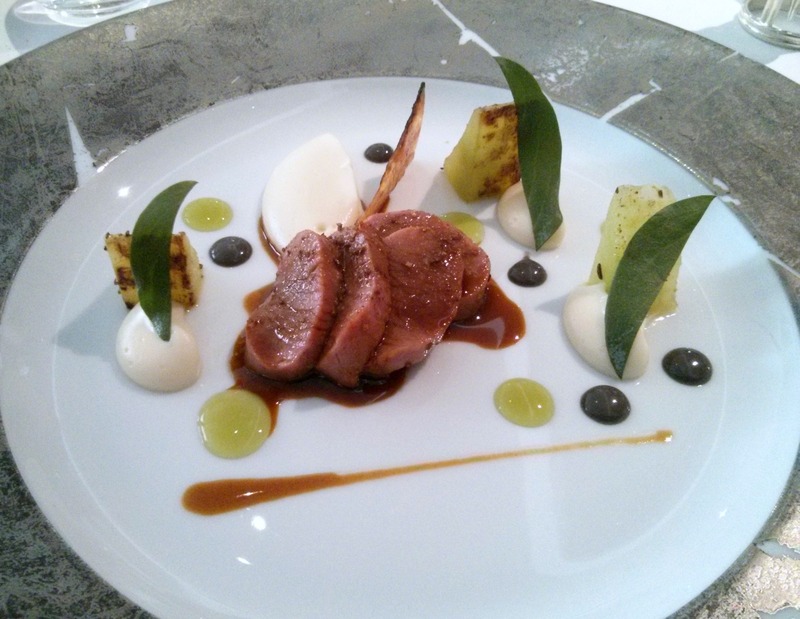 The lamb dish was a delight, the dish coming in two parts, lamb with cucumber, gravy and an interesting salty caviar puree in place of anchovies, and taking the roast and anchovies concept a stage further. 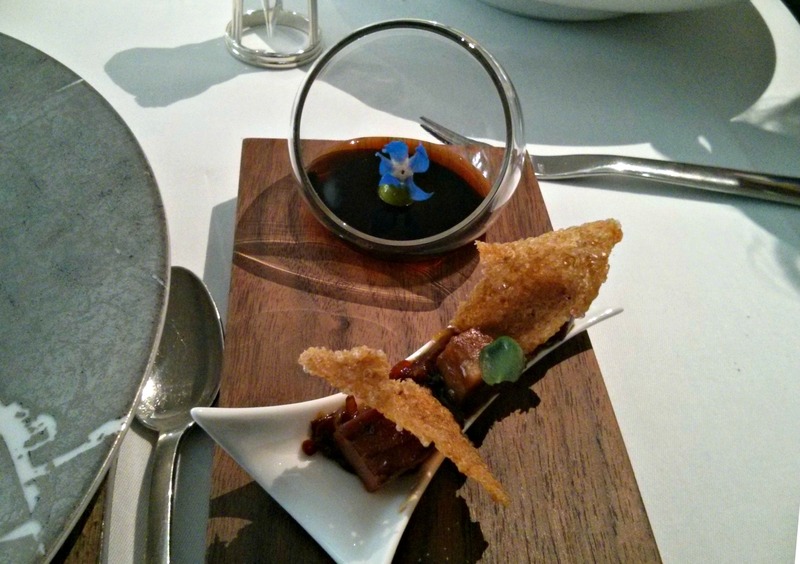 The second part was a small glass dish of broth and some utterly fantastic sweetbreads turned into wafers with some cubes of tongue and caramelised onion. 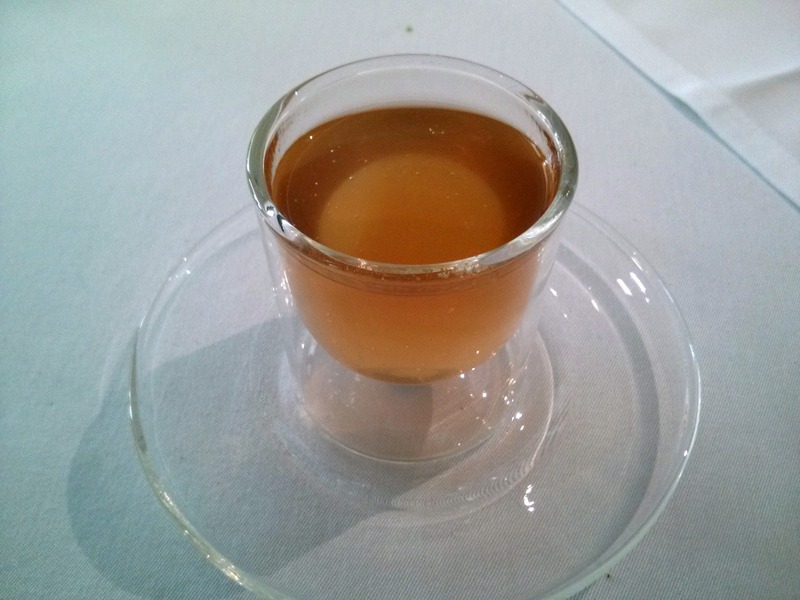 In between the main course and dessert, Hot and Cold Tea. If you line up the glass correctly you get have hot tea one on side of your mouth and cold on the other, most unusual. 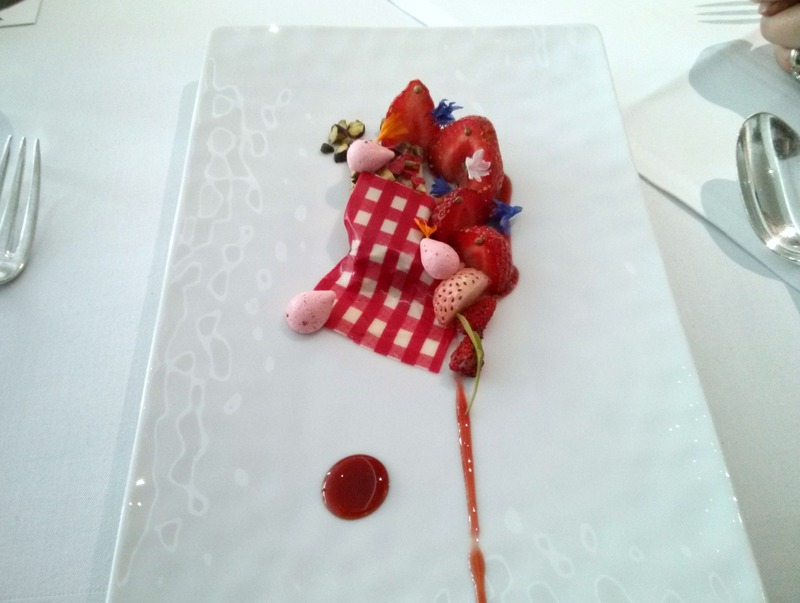 The first dessert was based on a English summer picnic, and came in two parts, a wonderful little cone of jelly and ice cream to start, then the main dish, macerated strawberries. These vacuum prepared strawberries came with a pistachio shortbread covered in a white chocolate blanket, printed in a vivid tartan pattern to represent the picnic rug. Lots of interesting things going on here, sticky, buttery flavours from the pistachios, shortbread and meringues, juicy strawberries, intense from the vacuum maceration, the tongue coated with a velvety white chocolate, all working in harmony. Our second dessert saw two very different desserts, as mine featured gelatin. My wife wasn't missing out though, as the an elaborate copper pan was set on a table by us, and a waitress appeared a sealed insulated jug and eggbox and her dish of Not-So-Full English Breakfast was announced. The eggbox contained a single egg, and this was cracked into the pan into which liquid nitrogen from the jug was poured and stirred, eventually an ice cream was removed, looking exactly like scrambled egg, and this was a placed on a slice of french toast, itself a brioche soaked in vanilla and then placed in a vacuum chamber to break down the cellulose before being cooked. 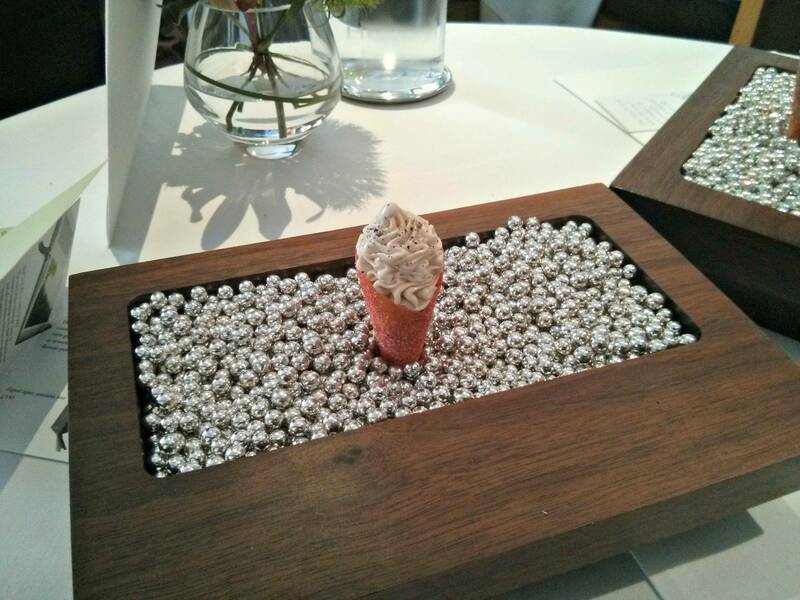 This was served with a small jar marked as Fat Duck Marmalade and covered in a sheet of tartan printed white chocolate. The yellow in the ice cream turned out to be saffron, and this creamy concoction, the perfectly caramelised french toast and the marmalade, itself infused with earl grey tea provided the most perfect breakfast. 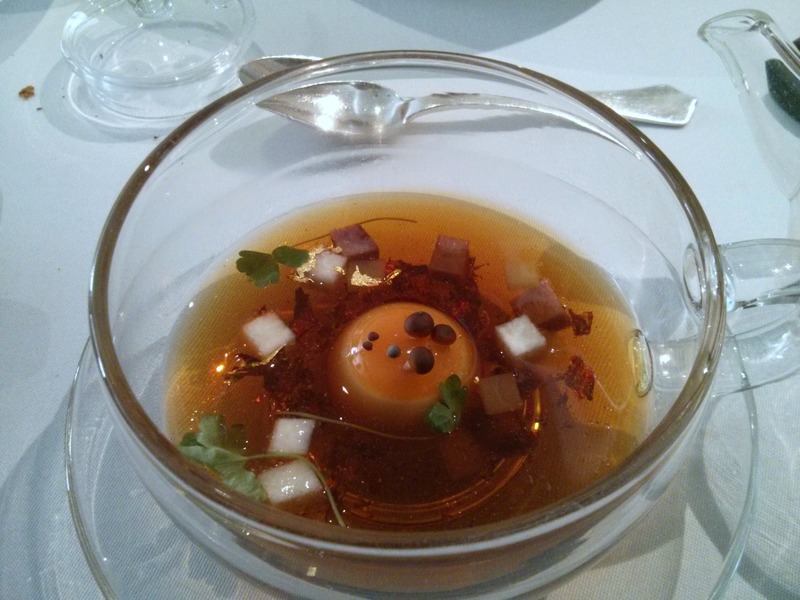 My dessert was Egg in Verjus, Verjus in Egg. 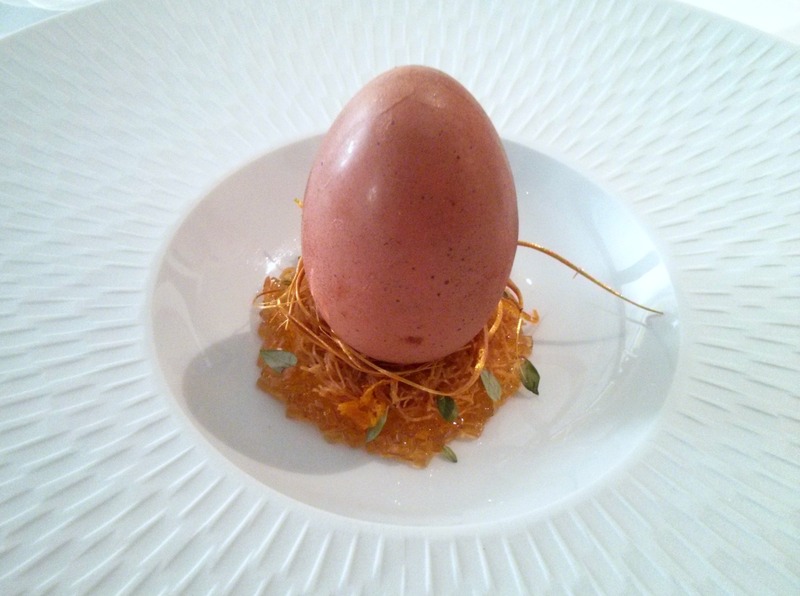 This was what looked like a large brown egg, placed on a bed of golden straw and orange jelly. I cracked the egg to reveal it was made of two types of chocolate, the exquisitely painted brown shell and an inner shell of white chocolate, and in this a fabulous white mousse with an orange liquid centre resembling a real egg. This was an absolutely gem of a dessert, a fun and incredibly technically complex design but packed with superb chocolate and citrus flavours too. The golden straw turned out to be sugar work, the bedding also included vermicelli pastry and provided some crunch and textures for balance. This well could be one of the best desserts I've ever had. 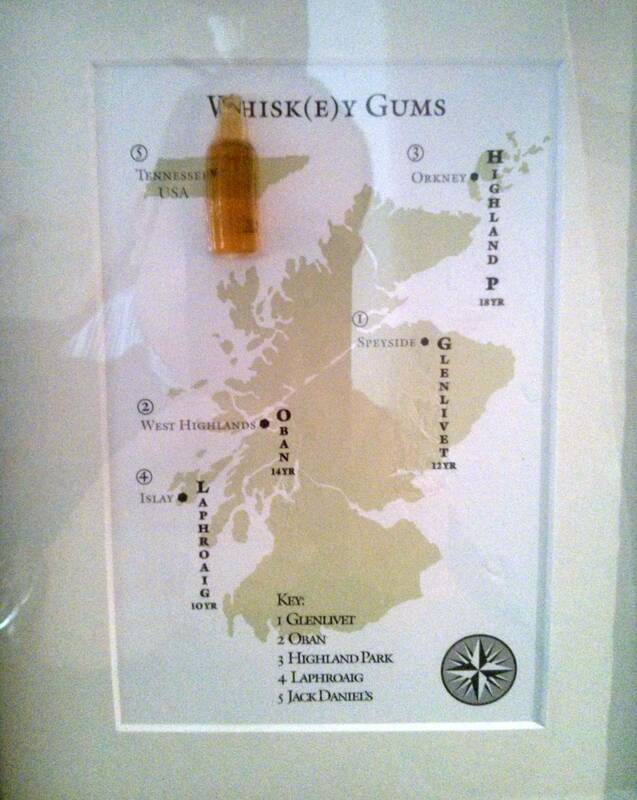 Following this was one for me only, a selection of whiskey flavoured jellies, as these contained gelatin. There was a nice blend of whiskey types, mild to strong, finishing on my favourite Jack Daniels. Coffee came with a paper bag containing sweet shop sweets, a classic combination of technical trickery, nostalgic flavours and scents done like only Heston can. 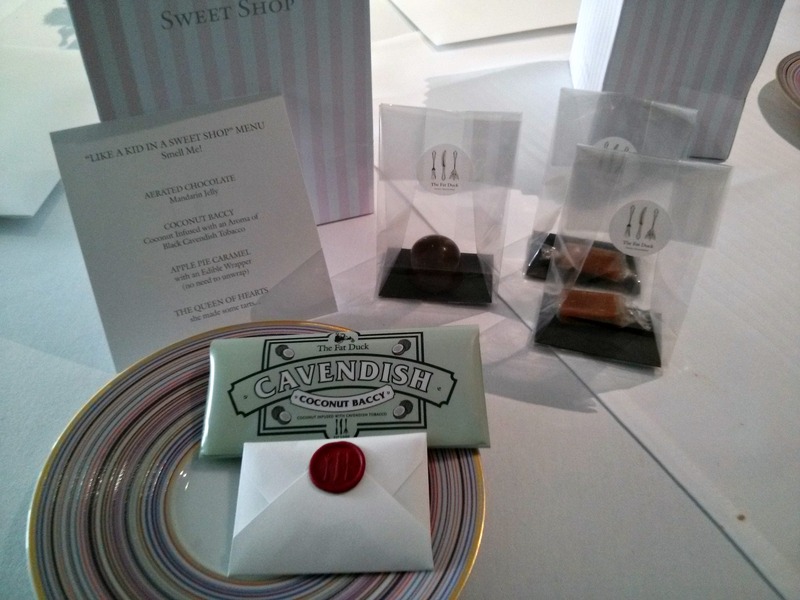 The mandarin aero chocolate was my favourite but the caramels, coconut baccy and white chocolate playing card were great too. The bill came to £530, a breathtaking figure considering we only had a glass of champagne to start with my wife an additional two glasses of wine but did reflect the jaw dropping amount of man hours required for preparing every single element in every single dish, with kitchen staff outnumbering diners, and a large team of highly professional front of house who serve a highly theatrical meal over an astonishing 4 and half hours. 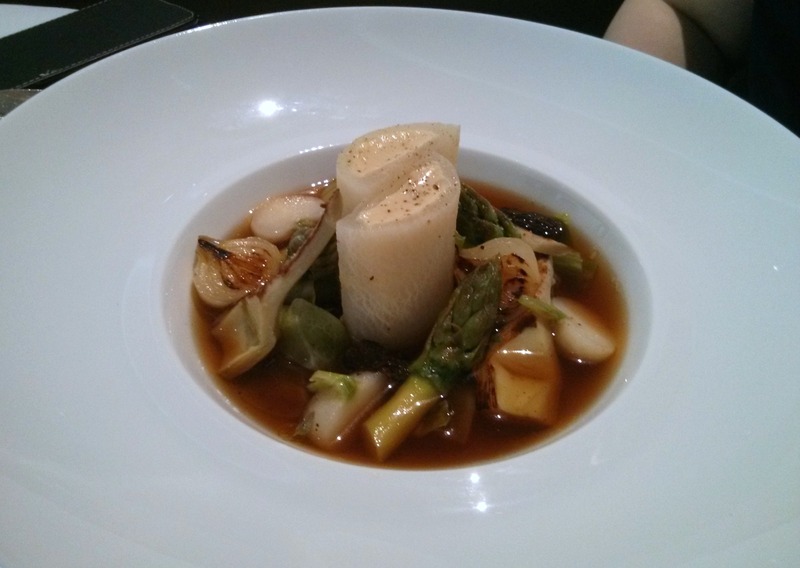 The food itself was fantastic, every dish memorable with equally brilliant standard and vegetarian menus. 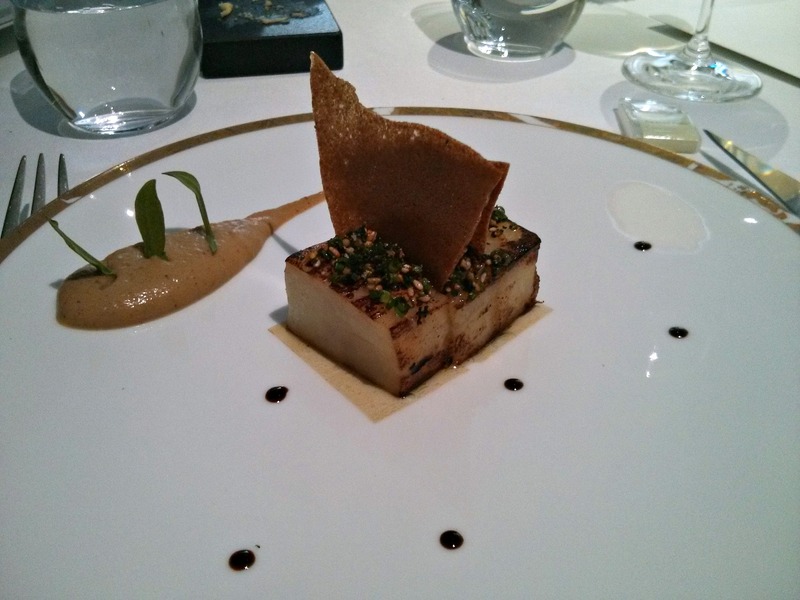 This is definitely one of the finest dining experiences to be had anywhere and the global fame of the Fat Duck is very much justified. Oak moss, jelly of quail, crayfish cream, chicken parfait. This is the review I've been waiting for. The vegetarian menu looks interesting for sure, but I'm a bit put off by repetition of mushrooms, beetroot, horseradish and seaweed (the ingredient I just cannot eat). And not giving your wife a replacement for the wine gums is inexcusable. I do find the cost off-putting. There is that little voice in my head, "I could go to L'Enclume twice". Thanks for another informative posting. The thing with The Fat Duck if you gave advance notice you only want mushrooms, beetroot and horseradish once, didn't like seaweed and made it clear that a replacement for the gums is required they may well accommodate your needs. If I had to go back I'd rather have the aubergine and beetroot risotto dishes over the foie and salmon, they were truly outstanding.